Philips Airfryer Review - Turbostar HD9641 Digital • Editor's Pick and Here's Why! This Philips airfryer review covers the newer Philips TurboStar Airfryer digital model HD9641. Considered the “next generation”, the TurboStar has been redesigned to make it even more consumer friendly than its predecessors. The HD9641 is a 1.8 pound, standard size air fryer with a digital display panel and a unique new QuickControl dial. Improvements include parts that disassemble for easier cleaning and a somewhat sleeker build that doesn’t take up quite so much room on your counter top. The Philips brand is our top pick here at The Healthy Kitchen Shop – more on that below. However it’s also the most expensive, so it may not be for everyone. If you’re looking for an air fryer with similar features at a lower price, please check out our reviews of the Nuwave and GoWISE models. Otherwise, keep reading to find out why we love Philips and think it’s worth every penny. What’s Included with the Philips HD9641 Airfryer? Philips is the original air fryer manufacturer and has earned an excellent reputation with consumers. Owners give this brand high marks for quality construction, durability, and excellent performance in cooking a tremendous variety of foods. The majority of my first-hand experience is with the original Philips models. I own two Philips HD9230 units, one with temperature settings in Fahrenheit and the other in Celsius. These two units were used for all cooking involved in developing and testing recipes for The Air Fryer Bible, which I co-authored with Elizabeth Hickman. Our cookbook includes over 200 recipes, and with each one being tested multiple times that added up to a tremendous amount of cooking. Those two Philips air fryers were used almost daily for months on end. Many times we kept them going all day long with hardly a pause between one dish and the next. There was never any hint of overheating or any other issue, and today both units still work like a charm. It is easily safe to say that these two units were used more in about 9 months than the average consumer will use one in a lifetime. That is certainly a testament to durability. Also worth noting is that we cooked a full range of food types – meats, vegetables, eggs and other breakfast dishes, appetizers, desserts, air fried fruit, sandwiches and snacks, roasted nuts and chickpeas, muffins, cakes, bread and other baked goods, you name it. The Philips air fryers did an excellent job of cooking everything evenly and completely. In some cases it was necessary to shake the basket or turn foods, but that is required with any brand. In fairness, my experience with other brands is extremely limited. We tried one very cheap model (less than $60) that couldn’t get through cooking a grilled cheese sandwich without overheating. Another, the Power Airfryer XL, worked okay but unlike the Philips, it did not cook foods evenly. If you want to save money I suggest Nuwave or GoWISE, but personally, I’m just sold on Philips. Update July, 2018:I now also own a Philips HD9641. It was used extensively during recipe development and testing for our new cookbook, The Complete Vegan Air Fryer Cookbook. Like the older models, this new HD9641 did not disappoint. It has been excellent in performance and durability. Most people who see air fryers for the first time are surprised at how large they are on the outside and how small on the inside. Philips redesigned this model to maintain the 1.8 pound interior cooking capacity but reduce the overall size of the machine by about 20%. It doesn’t make a huge difference, but it will save you at least a little counter space. The control panel has changed so that you still have a digital display but control it with a dial. This may be a matter of personal preference, but some of us tend to like a dial better because it’s faster than your standard digital control. Perhaps the best improvement is that the basket can be disassembled, so the mesh bottom can be removed for easier cleaning. Also, the handle can be detached for storage. The latter may seem trivial, but if you purchase the grill plate (sold separately), it takes up a lot less cabinet space because you use the same handle for both the basket and the plate. What hasn’t changed is the star shaped bottom of the air fryer drawer, which serves to distribute the rapidly circulating air for more even cooking. As well, some parts of the unit are still dishwasher safe, and this model includes adjustable temperature, timer, and automatic shut off features. A “Keep Warm” function has been added, but to my mind that isn’t a big deal. These air fryers do an amazing job of reheating foods without drying them out (as in an oven) or making them tough and chewy (as in a microwave). If something cools off before you’re ready to eat, just toss it back in the fryer and it will quickly reheat as if it were freshly cooked. The worst thing you can say about Philips is that their documentation leaves something to be desired for English speaking consumers. If you like, you can view the owner manual here. However, this is not a huge problem because air fryers just aren’t that complicated. Some people do find the new handle on this model a bit tricky. If you have trouble, Philips provides instructions with an illustration. Go to this FAQ page, scroll down to “Instructions”, and see “How do I detach/attach the EasyClick handle on my Philips Airfryer?”. You may see different measurements and weight listed on the product page at Amazon. As those numbers can sometimes be unreliable, our figures are taken from the technical specification page on the Philips website. 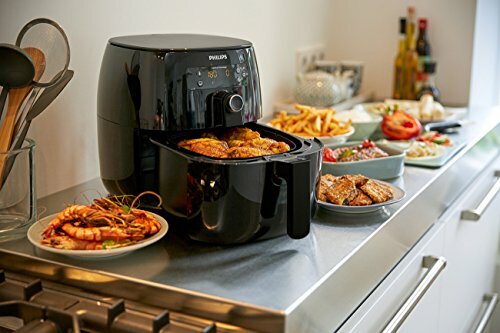 The Philips TurboStar Airfryer, Model HD9641 in Black, does not include any extras. All accessories are sold separately. What you may find is this exact air fryer bundled with a cookbook that was created by the manufacturer, and the price is exorbitant. I have seen it cost as much as $90 more! I’ve also never seen a manufacturer’s cookbook worth a tenth of that price. Though not a must-have item, the grill pan can be very useful for getting a browner exterior on foods such as marinated chicken strips that are not breaded. It claims to be for searing meat, but do not expect the same results as you would get with a super hot skillet or fire grill. The accessory you will love is the baking pan, but there is no reason to pay premium price for the Philips brand pan. Instead, I strongly recommend the set shown at right. I own both this and the Philips brand and can attest that the quality is identical, and this set costs half what you’ll pay for the Philips pan alone. In my experience this is one of those ideas that sounds a lot better than it works. For example, when using this rack to cook 2 layers of chicken strips at once, you cannot get to the bottom layer to turn them or check for doneness. You have to remove the rack first, which can be tricky when it’s blazing hot. For an exact fit you must order the Philips brand, which is pictured at right. For a less expensive alternative, you can purchase the Numarda accessory set pictured at right. I do not have personal experience with this brand, but it certainly has an attractive price! Thus far there are very few complaints, and most of those are unwarranted. This air fryer earned a 1 star rating from one person because “the Philips basket is too small”. Actually, it has the same cooking capacity as other standard size air fryers. If you need more room, changing brands won’t help. You must look for an extra large size air fryer. A couple of other folks complained that the instruction manual is terrible. Granted, it could be better, but as mentioned above, air fryers aren’t that difficult to operate. If you think this might be a deal breaker for you, see the manual online here before you buy. One person was upset to discover that the temperature adjusts in 25 degree increments, but in my extensive experience that is not important. One of my Philips air fryers uses Fahrenheit and adjusts in 25 degree increments. The other uses Celsius and adjusts in 5 degree increments. After cooking hundreds of dishes in both, I found no advantage to having more temperature choices. This was especially important when testing recipes that went into the cookbook, so we paid very close attention. Even with baked goods such as cakes, muffins, and breads, being limited to 25 degree adjustments did not present any kind of problem or challenge. Finally, there was the one person who claimed this air fryer is fairly useless as it “won’t cook anything but French Fries”. Oh my, nothing could be further from the truth! One of the most fun things about air fryers is discovering how versatile they are. Try a beef ribeye. You’ll be stunned at the results (and that from a devout steak lover!). Bake scones, cinnamon rolls, brownies, and hand pies. Cook a pork loin, calzone, coconut shrimp, chicken taquitos, every kind of fried vegetable or fruit you can imagine, the list is almost endless. In fact, it’s an unfamiliar cooking method for most people, so it may taking a little getting used to. If you’re happy just cooking fries and pre-packaged frozen snacks, fine. If you want to really enjoy your air fryer, get a good cookbook. It will make all the difference, and you will have so much fun! The bottom line is, even though there is not yet a tremendous amount of feedback on this model, so far the Philips Turbostar Airfryer is living up to its maufacturer’s established reputation. Unless you want to bash the instruction manual, it’s hard to find anything bad to say about Philips. For the record, all of the Philips models are made in China – but to the best of my knowledge, all air fryers currently on the market are made in China. Regardless, Philips seems to be maintaining a good handle on quality control, and reports on customer service are favorable. If you are in the market for a standard size air fryer, the Philips TurboStar HD9641 is top of the line. Previous models have earned high marks for being easy to operate and to clean, and this new addition to their product line includes improvements to make it even more user friendly. With a good cookbook and a little practice, chances are that you will be very pleased with this air fryer. For more cooking capacity, click here for complete information about large air fryer models. The BEST air fryer cookbook!